Diamond Head is a hugely popular tourist attraction on the south-eastern shore of Oahu. Due to it’s relatively close proximity to Waikiki Beach (two to three miles away, depending on which end of Waikiki you’re on), this is one of the most heavily trekked hikes on island. It’s also one of only three crater hikes located on Oahu; the other two being Koko Head, a more moderate hike and my personal favorite, and Ka’au Crater, a fairly intense hike that takes about five hours and has access to three different waterfalls. 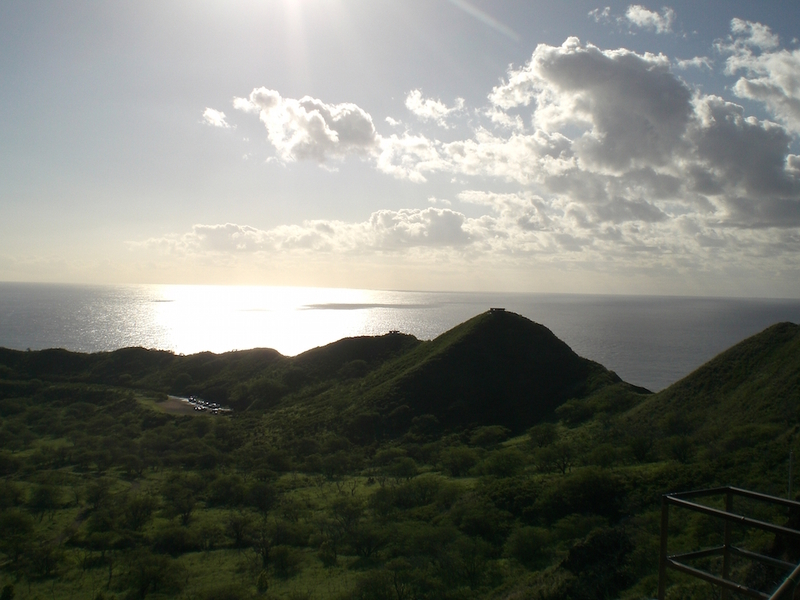 Diamond Head is one of the few hikes on island that has an entrance fee. If you drive up and want a parking space, it’s $5 per vehicle (doesn’t matter how many people are inside that vehicle). If you walk to the park, it’s only $1 per person to get in. Many people who hike solo or with just one other person park outside the tunnel that acts as the entrance to Diamond Head and then they walk in from there to save a few bucks. Obviously if you have five or more people, you might as well park inside. Beyond the parking lot, there is a sidewalk that takes you to the beginning of the hike. From there you will ascend several sections of the trail looping back and forth upon itself as you slowly climb up the inside of the crater. The trail has undergone a lot of maintenance in recent years and although it’s not paved, you could still go up this thing in flip flops. About 15 minutes in, you will come across the first lookout area where you can stop and take photos of the eastern shore. Soon after the lookout you will come to the first set of stairs. After climbing 74 stairs, you will be at the bottom of “the tunnel”. The tunnel is about 200 feet long and has recently had lighting added (it used to be pitch black). After the tunnel you will have two choices: to your immediate right there is another staircase with 99 stairs and to the left there is a lookout area followed by some other stairs; both paths lead you to the same place. If you go to the left, just make sure you exit coming down the other path so you get to see the entire trail. I recommend going to the right, up the 99 stairs, and then coming down the other way. After the staircase there is a short tunnel leading to the bottom of a spiral staircase. Follow the stairs up until you are inside of the old bunker looking out. You’ll need to duck or crawl out of the front opening of the bunker to continue, as it has only about a three foot high opening. There’s only another short climb to the very top where you can look out over Waikiki. Once your hike is complete, I recommend getting a snow cone (or “shaved ice”, as the locals call it) from the food truck near the entrance. Fee: $5 per vehicle to drive in or $1 per person to walk in. Length of hike: The trail is 1.6 miles, round-trip, and takes about an hour to complete. Best time to go: The park opens at 6am and I recommend getting there by 9am. The trail is uncovered so it gets pretty toasty. You may have more difficulty getting parking the later you go, and may even have to wait in line to get a spot. The last entrance time is at 4:30pm and the park closes at 6pm. Worst time to go: Mid-day. It will be significantly hotter and you will have to deal with the crowds, including busloads of Japanese tourists who are on scheduled stops.